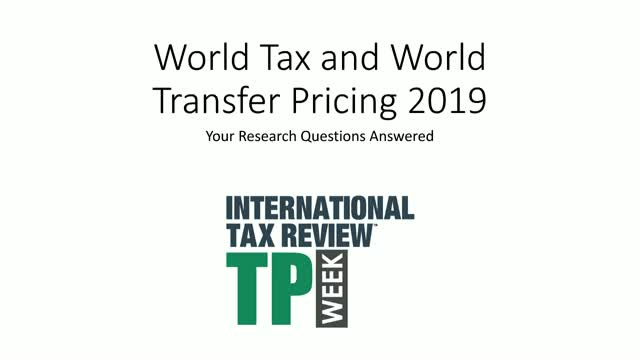 Join editor Jon Moore for this exclusive webinar to learn more about the research process for World Tax and World Transfer Pricing 2019. 1. Preview of the 2019 questionnaire. 2. Research guidelines / timelines for surveys and interviews. 3. How firms are selected / ranked. 4. Best practice for completing submissions and client lists. The sixth annual Benchmark Canada awards ceremony was held on Thursday, March 7 2019 at The St Regis in Toronto. Over 170 private practice, in-house and other guests attended, making it the largest ceremony ever held for Benchmark Canada. Robert Harrison of Fasken and John Singleton of Singleton Urquhart Reynolds Vogel both received standing ovations as they were inducted into the Benchmark Litigation Hall of Fame. Special mention must be made for Blair Yorke-Slader of Bennett Jones who pocketed three individual trophies, including the coveted Trial Lawyer of the Year. Yorke-Slader also picked up Bennett Jones' trophy for the much-covered Dow Chemical Canada ULC v. Nova Chemicals Corporation case. Join lead researcher Danielle Ngwana-Joseph for this exclusive webinar to learn more about the research process for Benchmark Litigation Europe 2019. Join this exclusive webinar to learn more about Benchmark Latin America 2019 research process, hosted by in-house editor, Shailyn Tirado and Paul Ptaschne, Director of Business Development. Join this exclusive webinar to learn more about Benchmark Litigation's 2020 research process. Hosted by in-house editor, Michael Rafalowich. 6.Learn about firm and Individual Bios on the Benchmark website and in the Handbook. Join North America Editor, Kurt Stumpo and Latin America Editor, Rani Mehta for this exclusive webinar to learn more about the research process for IFLR1000 US. 1. Research guidelines / timelines for surveys and interviews. 2. How firms are selected / ranked. 3. Best practice for completing submissions and client lists. 4. Information about our new Real Estate rankings. In this webinar, the Benchmark Litigation team will provide more information on the annual research process, including how to prepare submissions and the timescale of the research. Join this exclusive webinar to learn more about Managing Intellectual Property IP STARS and our research for the 2019 edition. Hosted by IFLR1000 Editor Ben Naylor the webinar will provide with everything you need to know about the guide and our research. In this webinar the asialaw team will provide more information on the annual research process, including how to prepare submissions and the timescale of the research. The webinar will also provide further information on the realignment of the guide to focus on industry sector specialisms within law firms. - Introduction to our industry sector focus. Join this webinar to learn how firms like Baker McKenzie and McKool Smith are using bespoke content marketing solutions to stand out from the crowd and delivering meaningful business development opportunities to their organizations. This interactive panel discussion will explore the do’s and don’ts of high-level thought leadership and content marketing programs, with an emphasis on the power of working collaboratively with the right organization to achieve your objectives. Host: Tom St. Denis, Managing Director of LMG Research. Join this exclusive webinar to learn more about Benchmark Litigation's 2019 research process. Our panel of experts include our in house editor, Michael Rafalowich, and distinguished guests, Director of Marketing at Hueston Hennigan LLP, Lisa Richardson, Associate Director of Business Development at Weil, Gotshal & Manges LLP, Dan McMenamin, and Director of Marketing and Communications at Bernstein Litowitz Berger & Grossmann LLP, Alexander Coxe. 5. Firm and Individual Bios on website and in the Handbook. Join this exclusive webinar to learn more about Benchmark Litigation's 2018 research process. Our panel of experts include our in house editor, Michael Rafalowich, and distinguished guests, Litigation Business Development Content Manager at Cravath, Melissa Kho, Managing Director at Baretz Brunelle Kelsey Nason, and Director of Marketing and Communications at Bernstein Litowitz Berger & Grossmann LLP, Alexander Coxe. Let's kick off the year right. Join this exclusive webinar to learn more about Benchmark Litigation's research process. Our panel of experts include our in house editor, Michael Rafalowich, and distinguished guests, Business Development Manager - Litigation at Davis Polk, Kathryn Sheehy, Vice President at Hellerman Baretz Communications, Kelsey Nason and Director of Marketing and Communications at Bernstein Litowitz Berger & Grossmann LLP, Alexander Coxe. So your firm is ranked in Benchmark Litigation; Now what? Join this exclusive webinar to learn about best practices and advice for marketing your firm's presence within the 2016 edition of Benchmark Litigation. Law firm marketing, business development professionals and external marketing consultants will share their insights into effective marketing strategies around Benchmark content. This webinar will be interactive. Attendees are encouraged to submit questions in advance and during the live event. Euromoney's LMG Research group delivers marketing and business development solutions for law firms around the world. Our products and services include research, surveys and rankings, covering the leading firms and practitioners by practice areas, industries, and jurisdiction. Our key legal directory brands are IFLR1000, IP STARS, World Tax & World TP, Benchmark Litigation, and Asialaw. We also provide co-publishing and thought leadership content services to legal and advisory firms through our market-leading premium content brands: IFLR, Managing IP, International Tax Review, and TP Week.